I started August with the goal of making two blocks. I had a problem with my book (I was missing quite a few pages), but Fat Quarter Shop got me a new one sent quickly and the first thing I did was make sure the pages were all there 🙂 My goal was to make 2 blocks, any blocks, not necessarily the first two blocks. However, I got my new book so quickly that I decided to start at the beginning and work my way thru. Block 1 went pretty quickly, it was the first time I had used a 30 degree ruler but the directions were pretty clear and I had the block finished in no time. I love the delicate pink and yellow prints. Not going to lie, I’m pretty proud of my center point on this one. There is a lot of fabric in that teeny tine center point and it’s difficult to sew and iron that section. Block 1 went pretty quickly, so onto block 2. This one is a smaller center medallion. Yeah, that center point is a little wonky, but I’m still pretty pleased with it. These are fun, but they are having to move to the back burner while I finish some other projects. They will come back out later this fall/winter to get finished, but for August, I managed to make my One Monthly Goal. Thanks, Denise! I feel like I’m getting better, you know what they say about practice 🙂 How are you doing? I think of you and Greg frequently and hope you’re recovering well. Sweet looking blocks…I can see why these are like potato chips…you can’t stop with just one! Wow – these blocks are just wonderful! 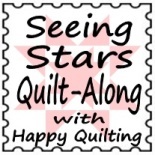 Thanks for linking up with Elm Street Quilts One Monthly Goal and thanks for linking up!